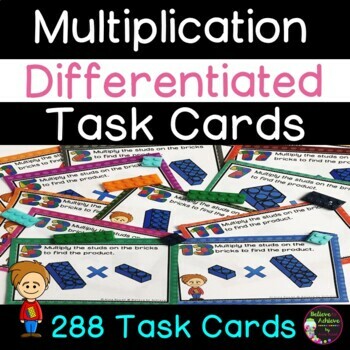 Multiplication TASK cards! Color Coded! Facts 1's to 12's! 288 Task Cards! Multiplication TASK cards! Color Coded! Facts 1's to 12's! Building Block Theme! 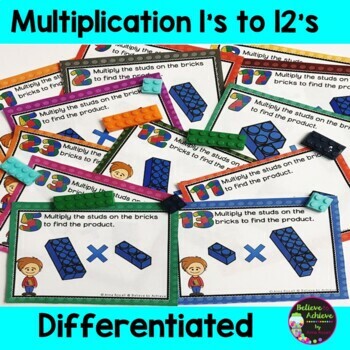 Are you looking for a new and creative way for students to work on multiplication facts 1's to 12's? This resource is just what you need! I've created 12 sets (24 cards in each set) for a total of 288 task cards! This resource lets you easily differentiate for your students and the cards are color coded! For example, some students could be working on the 2's time table set and another group could be working on the 10's times table set. Students will multiply the "studs" on each brick to work on the problems! This resource could be used for review, math stations, small group, class work, tutoring, or homework! You could copy them, laminate and use for years to come! ✿laminate and have handy in the classroom for math stations or fast finishers to practice. ❤Multiplication Practice! Timed tests and Answer keys included!